The conversion of methane into higher hydrocarbons, such as ethane or ethylene, is still a big challenge in the field of catalysis, mainly because the activation of methane is difficult due to its thermo-dynamical stability. Especially the efficiency of oxidative methane coupling is a major problem in currently available systems. Current methods achieve a high selectivity in the conversion of methane, but only a minor yield of higher alkanes, which are the primary goal of the conversion of methane. The combined structures of the well-known fluidized bed and a membrane reactor that now are offered, make it possible to achieve a notable increase of the efficiency of the selective oxidative conversion for higher alkanes. 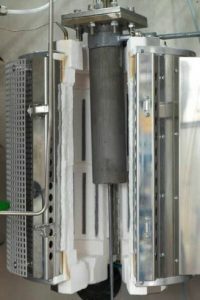 First experiments reached a methane conversion of 39 %, a selectivity of 56 % and a yield of 22 %, in contrast to common techniques with a methane conversion of only 39 %, a selectivity of 37 % and a yield of 14.5 %. The fluidized-bed membrane reactor is suitable for oxidative coupling of methane catalysis and heterogeneous catalysis in the chemical industry.